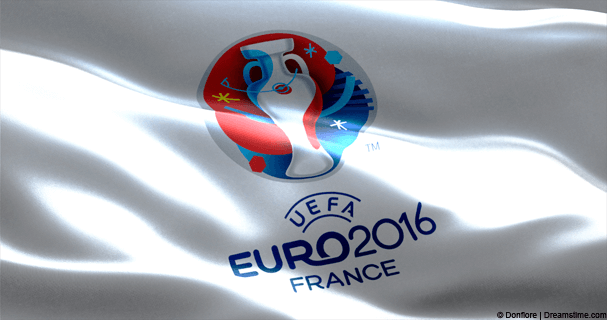 Euro 2016 also known as the 2016 UEFA European Championship takes place between June 10th, 2016 and July 10th, 2016. Finding a reliable place to watch the matches can be difficult. In many countries Euro 2016 will be shown on paid-for TV stations and in some regions around the world it won’t be shown at all. The good news is the entire tournament will be shown live on the UK’s BBC and ITV TV channels. They will also be streamed live online at the same time on both BBC iPlayer and ITV Player (ITV Hub). If you’re in the UK you can simply visit the required site but if you’re outside the UK then you’re going to need the help of a little tool called a VPN and in this article I’m going to look at how to use one to watch every match of the Euro 2016 tournament in any country in the world. Both BBC iPlayer and ITV Player (ITV Hub) will be showing all the Euro 2016 matches live online but if you’re outside the UK and you try to watch then you’ll be blocked and told you’re not in the correct region to view. Both websites check your internet connection to see where you’re located and when they see you’re not in the UK they block you from viewing. By using a service called a VPN (Virtual Private Network) you can alter your location and virtually reside in any country in the world. To watch the Euro 2016 matches you can use the VPN service to appear in the UK even though you’re in the USA, Brazil, Australia or anywhere else on the globe. Below I’ll show you where to get a VPN service to watch the Euro 2016 competition and also how easy it is to use. If you quickly Google the term “VPN” you’ll soon be overloaded with choice but not all are suitable for watching Euro 2016 online in any country. Firstly some are blocked on services like BBC iPlayer and others are too slow to stream live football. 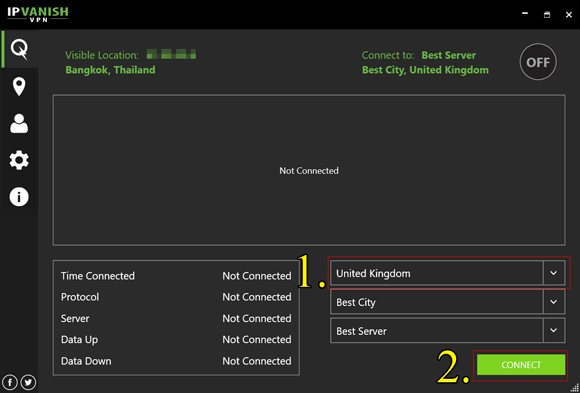 I’ve been testing a selection of VPN services to find the best for Euro 2016 and come to the conclusion that the following three make the best choices. All you need to do is click the name of one of the providers above and sign-up. A good VPN service should cost you no more than $5 – $10 per month which is roughly £3 – £6. Once you’ve signed up follow the guide below to see how to use the VPN to watch Euro 2016. Once you’ve signed up to a provider you need to download their software. I’m going to show you the process using IPVanish on a PC / Mac but the process is almost identical with ExpressVPN and StrongVPN too. The basic premise is you run the software from the VPN provider, connect to a United Kingdom server and then visit either BBC or ITV depending on who is showing what match. So, let’s take a look below. Download the IPVanish software for your PC or Mac from the “Apps” area of their website. Install and Run the software. Click UK Media or Gaming. The software will now make connection to the UK for you. Once it’s connected any website that you visit assumes you’re in the UK and in the case of Euro 2016 will stream you all the matches. For BBC iPlayer, you can just visit their website by using this link and for ITV Player, you can use this link. For ITV you’ll need to sign-up and enter a UK postcode. You can use any, a few to try are DN6 7HA, OX10 6SE, W14 9DH or SE21 7EG or you can simply search Google for your own. The full schedule of which channel each match is on is given below. All times given are BST. For CEST add one hour. Just connect to your VPN provider and then click the Watch Now button next to the matches below to visit the correct site. The later matches will be updated when it has been decided which TV channel they will be shown on. Christopher has been using the internet since 1994 and has a keen interest in privacy & security with a particular passion for encouraging VPN use. When not delving into the online world he enjoys globe trotting, breaking a sweat in the gym and photography.